I am finally back into things, even managed to answer most of my emails :), but I still need to pack away a lot of new stamping goodies. But I couldn't wait any longer to show you a creation with one of the new High Hopes stamps which I finally received. Ich bin langsam wieder in Schwung und habe es sogar schon geschafft (fast) alle meine emails zu beantworten. Ich muss nur mehr meine neuen Stempelsachen verräumen :) Trotzdem konnte ich es nicht mehr abwarten euch dieses Werk mit einem der neuen High Hopes Stempel zeigen, die ich nun endlich auch bekommen habe. "Alles ausser einer Karte" ist das Thema bei der High Hopes challenge diese Woche. Ich habe dieses tolle Tutorial für eine kleine Handtasche auf Betty's blog gefunden. Es war total einfach und schnell nachzubasteln (und Betty weiss wieviel Angst ich vor komplizierten Tutorials habe..haha). Ich habe die größere Variante gemacht und mit Basic Grey Papier der Porcelain Serie (ein Geschenk der lieben Jeanette) und dem Stempelmotiv Mildred von der neuen High Hopes Kollektion dekoriert. Coloriert habe ich mit Aquarellstiften und Twinkling H2O. 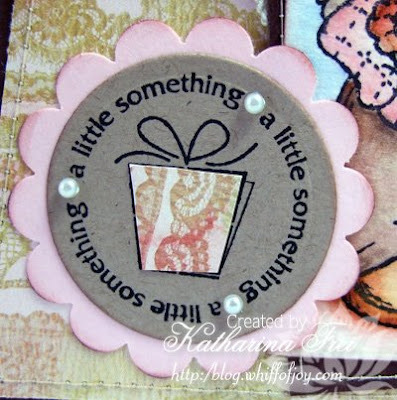 The sentiment is from Stampin' Up. I stamped it with StazOn jet black ink on SU kraft cardstock and cut it with my round Nestabilities. I stamped the sentiment again on the back of my design paper and cut out the present to adhere it over the one on the kraft cardstock. I also added some little halfpearls as embellishment. 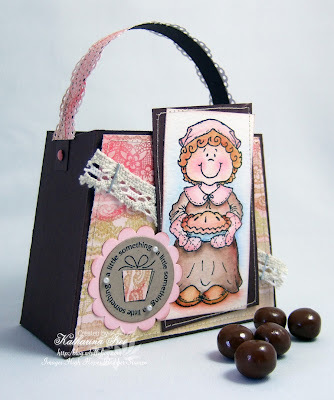 Mildred looks so happy after her baking, beautiful colours used on this pretty bag, so adorable! das täschchen ist gigantisch schön geworden, habe vor solchen sachen auch immer etwas angst! such a sweet little bag! Hope your son has a lovely birthday tomorrow! Love it Katharina! Hope your son will have a fab b'day tomorrow. What's on his wish list? Isac turns 3 in July and it's only bikes, tractor, cars and a Swedish soccer team outfit that's on his wish list ;-)) Kram and have fun! 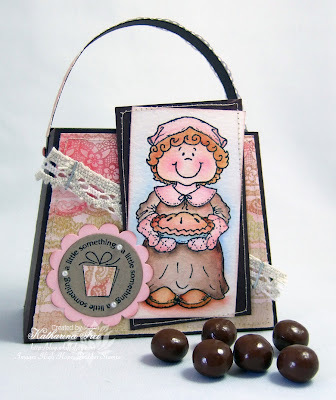 Oooh I adore your bag, just fabulous and your colouring of Mildred is awesome, love it! what a cute wee bag - think I need to get a Scor-pal!! Love the image. Great little treat bag. This is absolutely adorable. Just Too Perfect! Das Täschchen ist ja der Hammer. Habe mich kaputt gelacht, als ich das Motiv sah. Ist echt genial die Lady :-) Du hast das Täschchen echt super schön gemacht. Such a sweet goody bag !!! Hi Katharina......I just wanted to pass on this award to you that was given to me! - I visit your blog often although I dont always leave a comment - and I adore your stamps and needless to say that I have most of them. When this award was passed to me, I immediately thought of you! Thanks for your inspiration! Lovely little goodie bag. Very cute. Hope your son has a wonderful day. This is fabulous Katharina! Love it! !